The price of Bitcoin has been subject to wild fluctuations time and time again. As with any other financial asset, there are a multitude of factors that can affect the price of Bitcoin at any moment in time. Interestingly, to investors bitcoin more closely resembles a commodity than a currency. Its status is not tied to the strength of any particular economy, and it isn’t under the control of a central bank. Rather, supply is restricted, and price is set by those who sell bitcoin – just like gold or oil. As with any commodity, the laws of supply and demand are the biggest influences to a product’s price. When demand for bitcoin changes, so does the price. For instance, when there is a considerable rush by people to acquire bitcoin for one reason or another – public backing from a notable source, say – the price increases due to the rise in demand. Conversely, when people who already own bitcoins start trying to dispose of the currency at a higher rate than people are willing to acquire it, then its supply in the market increases and bitcoin’s price drops. But what causes people to start selling or buying bitcoin en masse? Threats from key government figures can cause people to lose confidence in the virtual currency, which in turn can result in a lower price. Alternatively, some governments choose to give cryptocurrencies, including bitcoin, a legitimate legal status, which encourages its use and hence improves its price. 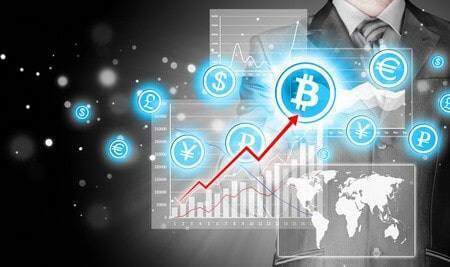 Bitcoin exchanges have become channels for financial traders to try to make profits from bitcoin volatility, especially in 2014 when those engaged in online forex currency trading found markets flat. When an investor with a sizeable financial outlay makes an investment in bitcoin, the price is likely to be affected. For instance, when a big investor dumps bitcoin in favour of another asset, bitcoin price is likely to take a hit. On the other hand, when a large investor decides to buy large quantities of bitcoin, the price will go up. More likely than one major investor moving price, however, is overall market sentiment driving movements. When PayPal publically backed bitcoin, for instance, positivity in the markets caused a bull run on the currency. Without a doubt, the media can have a very strong influence on the value of bitcoin. Just as major news stories can cause substantial changes in the price of currency pairs, news stories affecting bitcoin, both directly and indirectly, can also affect its price. In February 2014 news that one of the oldest and biggest bitcoin exchanges, Mt. Gox, was collapsing eroded investor confidence at that moment in time, causing the price of Bitcoin to tumble. With resulting headlines like ‘Is it the beginning of the end for Bitcoin?’ (Daily Mail 25 February, 2014) it’s not difficult to see why. The maelstrom of different factors involved in bitcoin volatility make it difficult to point to any single one for the majority of bitcoin movements. But understanding how instrumental news sites, investors and governments can be in the price of cryptocurrencies is a must if you are planning on taking advantage of the opportunities that bitcoin can offer.